Showcasing the brand's chevron quilted design, the Barbour International 'Camier' coat features ribbed side panels to create a flattering, feminine silhouette. 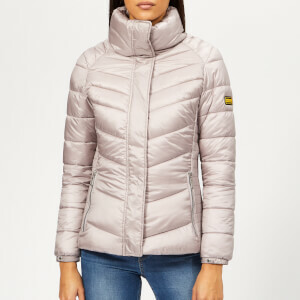 Softly padded with microfibre fill, the lightweight jacket comprises a funnel neckline, two external zip pockets and a two-way zip fastening with a press stud flap. An interior zip pocket offers storage for essentials. Complete with a silicone logo badge on the left sleeve, and elasticated cuffs with an adjustable popper. Silver-toned hardware throughout. Shell/Lining: 100% Polyamide. Filling: 100% Polyester.